Did you notice the small electronic screen with the gate opening time? What a great idea! 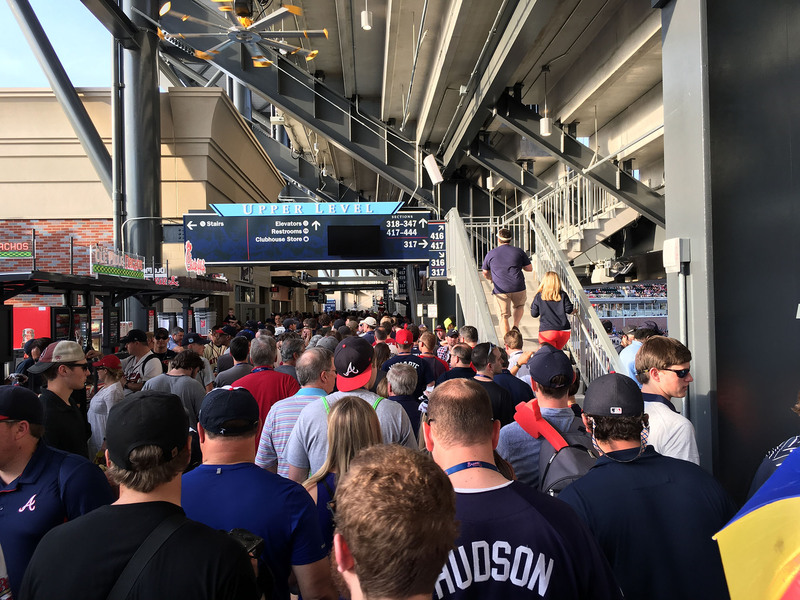 (I can’t count the number of times that I’ve been at a stadium and asked three different employees when the gates open and gotten three different answers.) 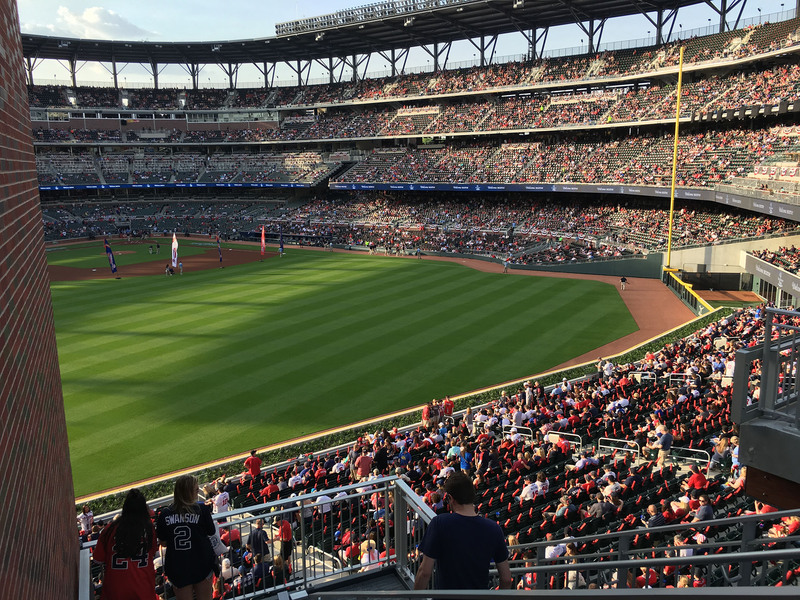 And best of all, the game was scheduled to begin at 7:35pm, which meant I’d get inside more than three hours early and see both teams take their full batting practice. 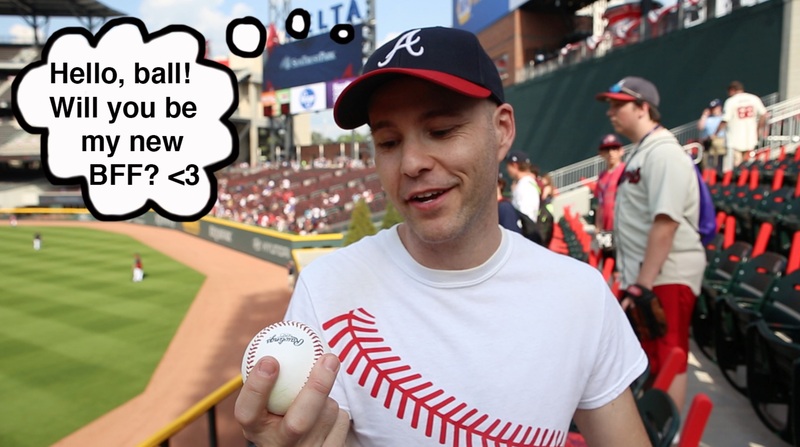 I wasn’t nervous about getting shut out — somehow I always find a way to snag at least one baseball — but I was feeling a little extra pressure with Brandon there filming, and I wanted as much ballhawking action as possible. 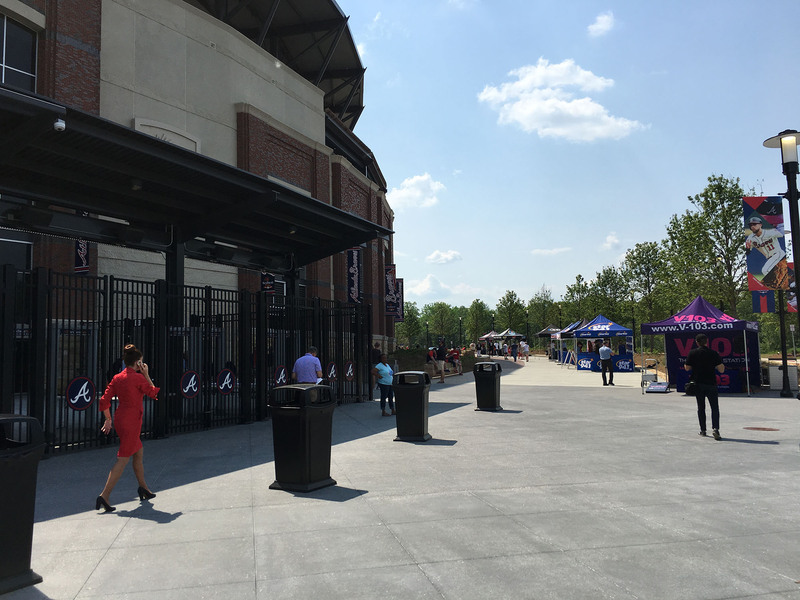 I walked counter-clockwise around the stadium . . . In case you can’t tell from that photo, they were Asian, and based on the snippets of their conversations that I overheard, I knew they were Japanese. That made me wonder: is Bobby Cox big in Japan? 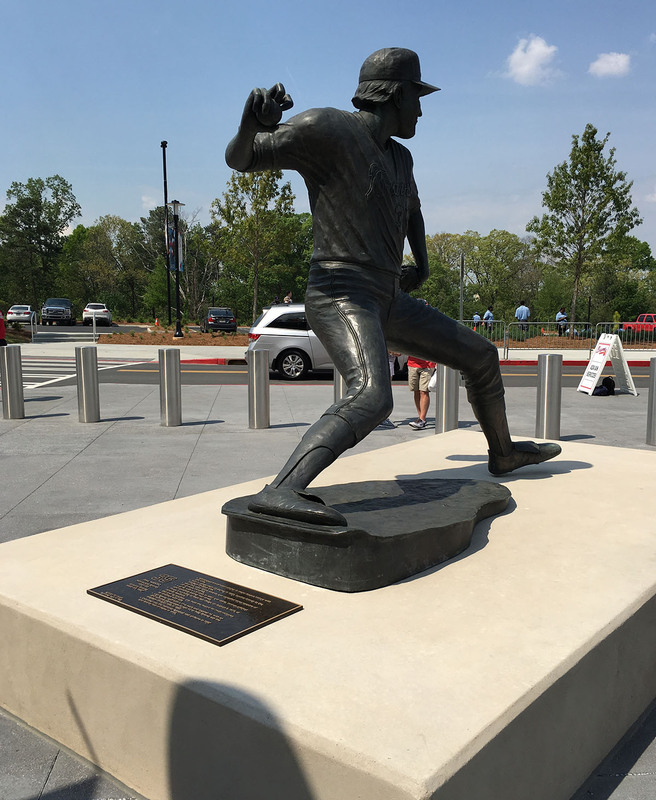 I mean, if that were a statue of Brad Clontz, would they have been just as excited? After the woman finished talking to him, Brandon told her about me, and I did a brief interview as well. You can see a bit of that in my video, which I’ll link to at the end of this blog entry, so keep scrolling/reading for now. 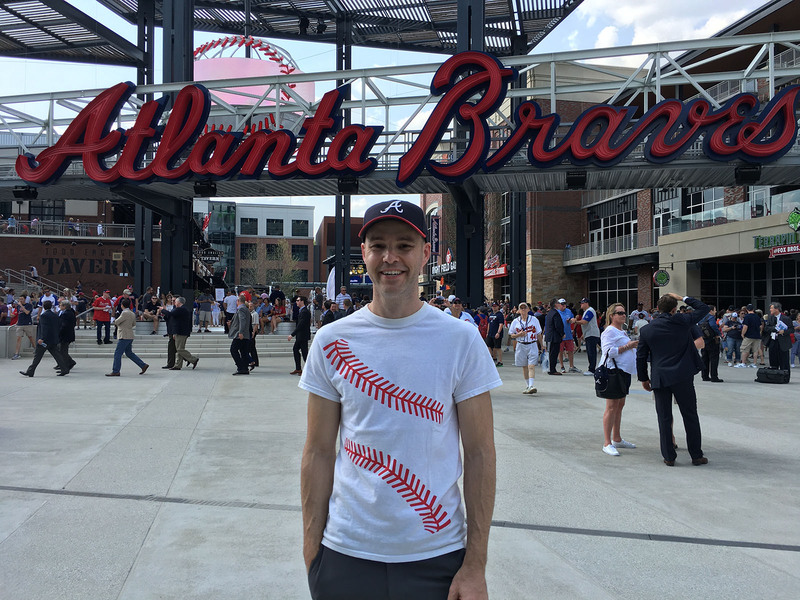 And by the way, I’ve blogged about all 52 of the other MLB stadiums I’ve been to. This entry makes it 53-for-53, and you can see those entries here, arranged neatly by stadium in alphabetical order. 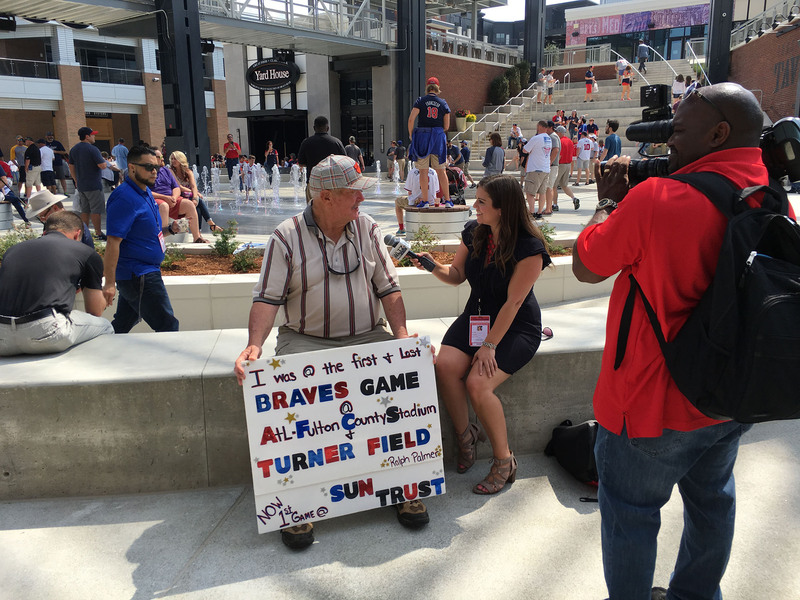 Here I am near a large Atlanta Braves sign outside the chop house gate. That’s Leigh (aka “Padre Leigh”) on the left and David on the right. Great guys. Leigh is as passionate about hitting up new stadiums as I am. 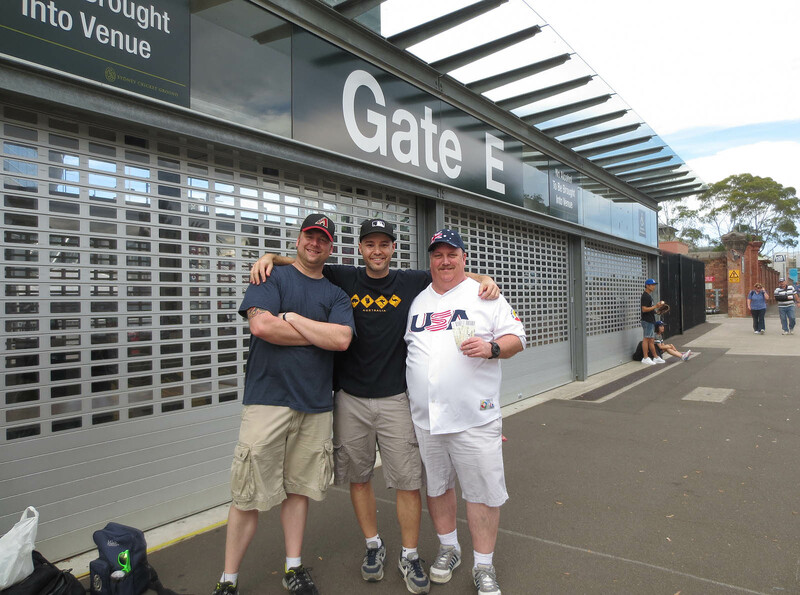 We met for the first time on 4/22/08 at Champion Stadium, and check this out — here’s a photo of us on 3/22/14 at the Sydney Cricket Ground. Remember when the Dodgers and Diamondbacks opened the MLB season there with a pair of regular-season games? Ooh yeah. 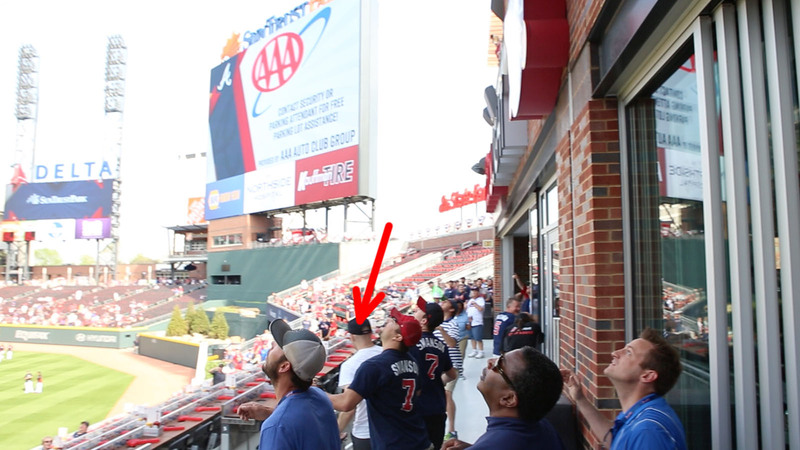 Based on my own ballhawking preview of the stadium, I knew that left field was the best place to catch home runs. 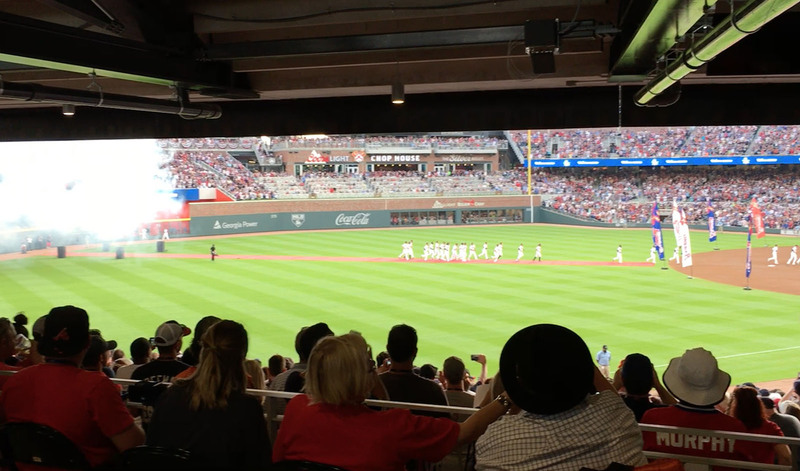 That said, I gave up on it quickly and headed over to right-center because (a) it got crowded within a few minutes and (b) several lefties started hitting. Umm . . . yeah. 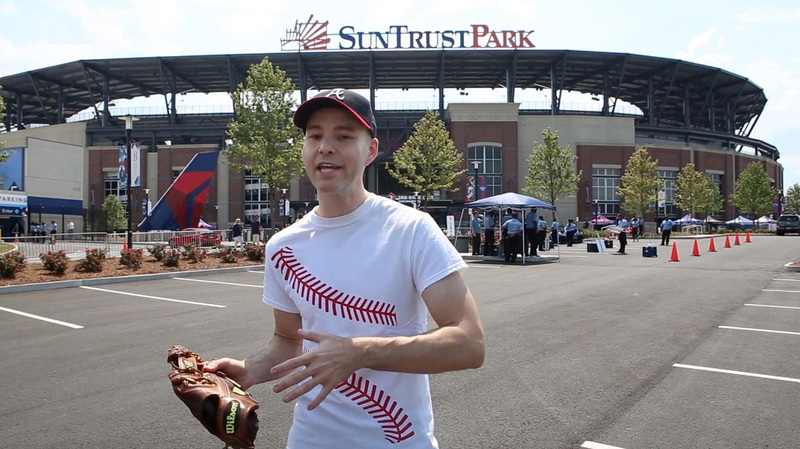 Before I say anything else, let me tell you that ALL of right field is difficult at this stadium. 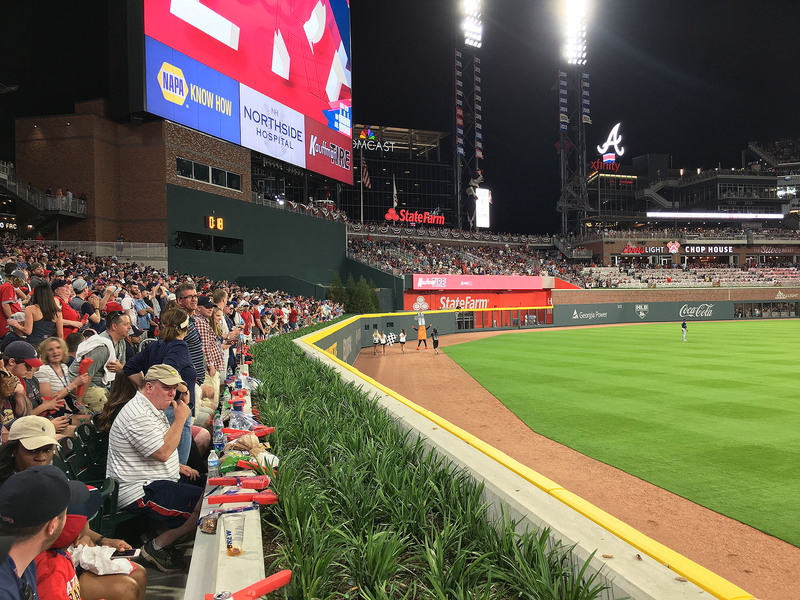 The problem with right-center is that most of the seats are behind the bullpen and approximately 20 feet high, so it takes a real blast for a ball to land there. 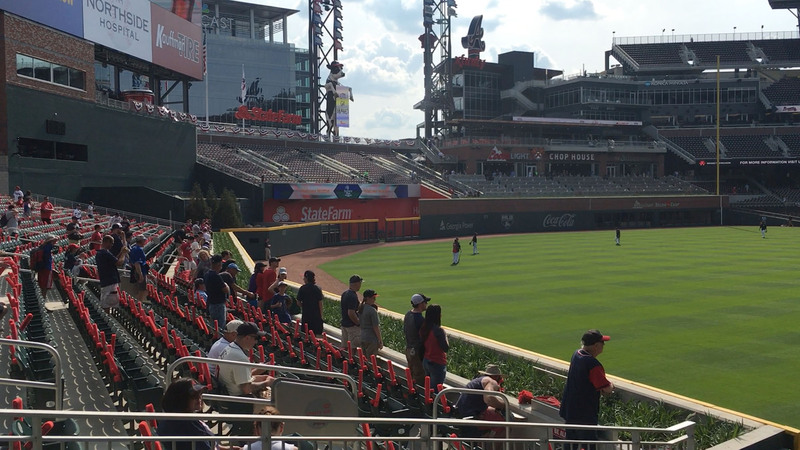 There IS one little patch of seats beside the bullpen, but it gets crowded there, so catching a home run in right-center is unlikely. Then there’s the chop house. 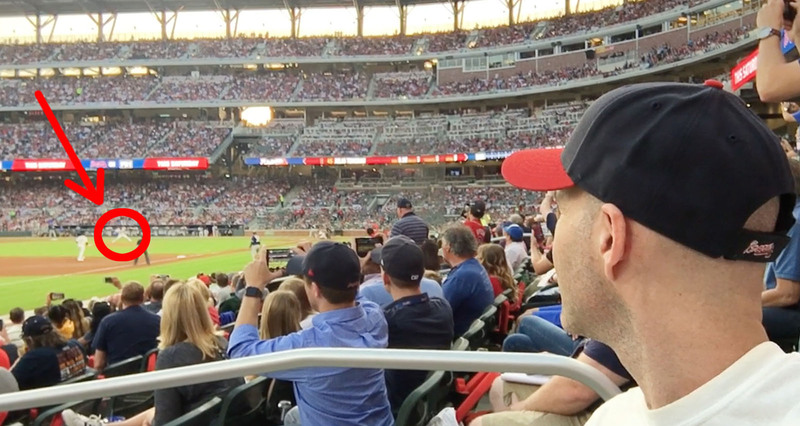 Lots of balls land there, but in order to enter the seating area, you need a ticket for that section, and those rows are narrow anyway, so the presence of just one other person clogs up the space and makes it nearly impossible to move from side to side. 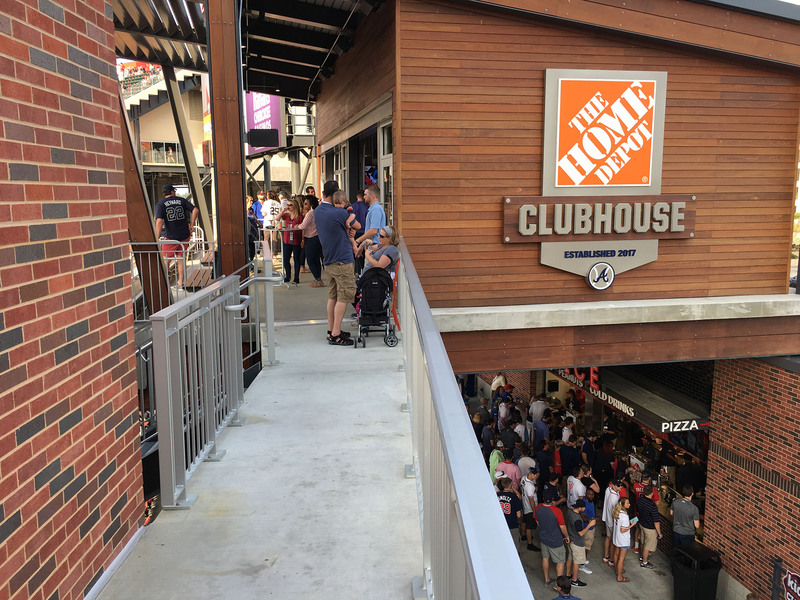 Therefore the only decent spot that was available to me in right field was directly under the “chop house” sign at the back of the section. That’s a somewhat narrow but wide-open area that connects the restaurant to the outdoor seating. Anyone is allowed to stand there, which is nice, but guess what? That just means it gets crowded as hell. 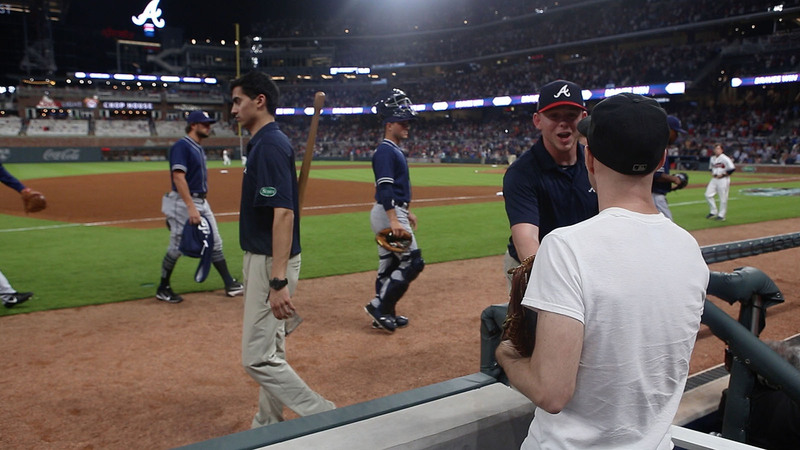 In the image above, that’s my glove and arm on the right-hand side. 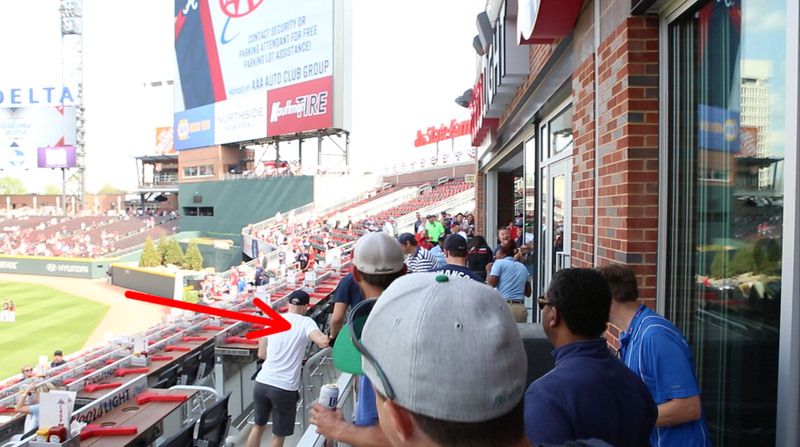 I hung back because it just wasn’t worth getting involved and potentially injured in that mayhem. For a gamer? Sure. (Or when I was 14? Of course!) But not a BP ball at this point in my life. Another issue with the chop house is that the back wall produces TONS of ricochets, so you really need to watch out. 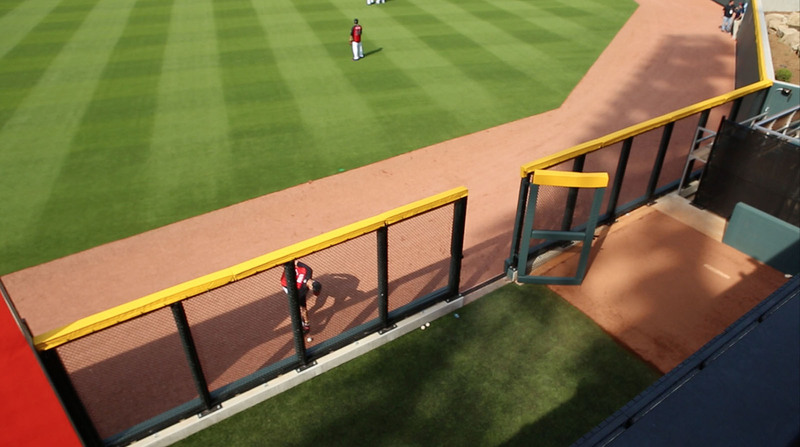 While that entire area looks cool and is probably a lovely spot to sit or stand and watch the game, it seems like an injury waiting to happen, especially during BP. I’m not sure who hit it, but if I had to guess, I’d say Nick Markakis. Did you spot me in the image above? 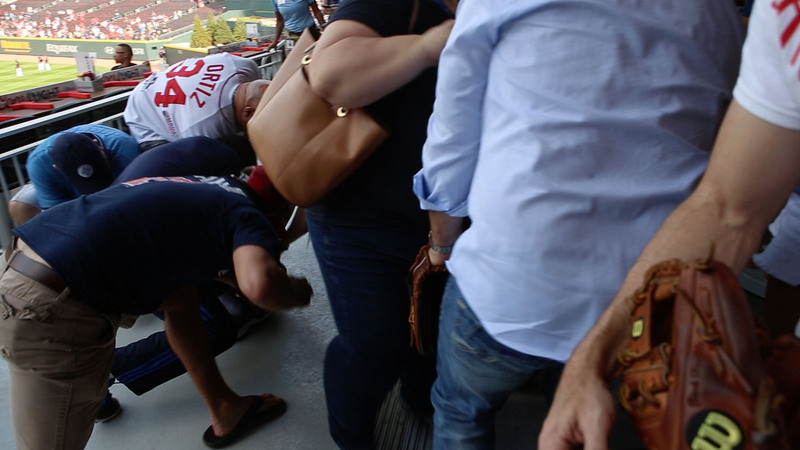 That’s me right in the middle on the stairs — not ideal circumstances to catch a baseball. 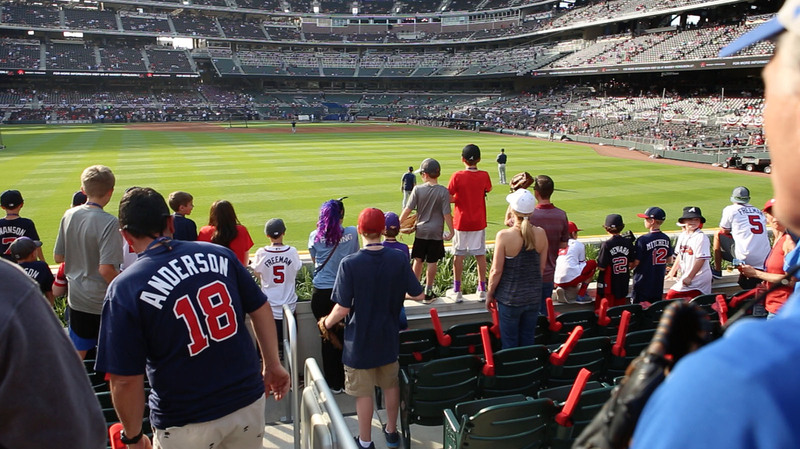 It was almost as crowded as BP for the Home Run Derby. 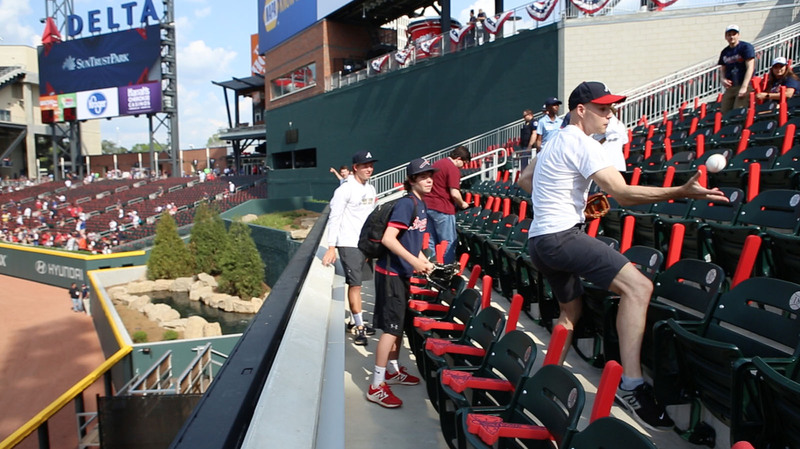 In an attempt to gain an edge, several kids stood atop the outfield wall! That double-wall, by the way, is yet another dangerous spot. 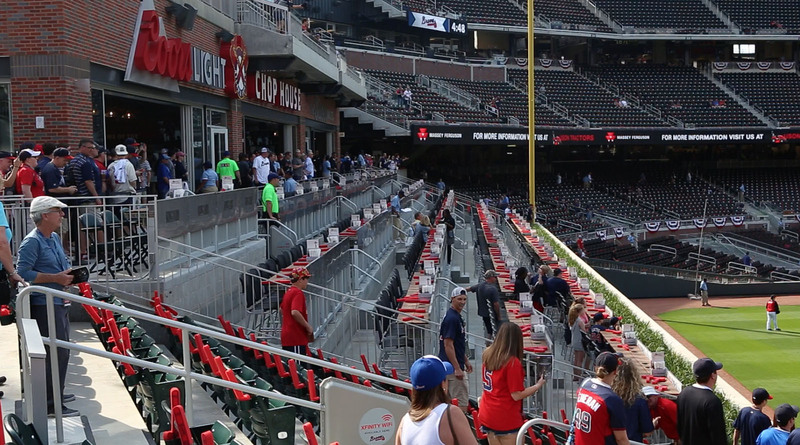 The actual outfield wall is too far away for people to reach from the stands, which of course is the point. 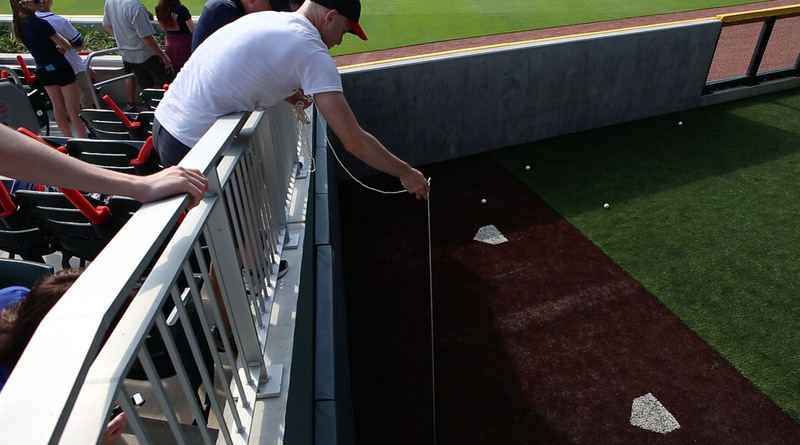 The stadium was designed like that to prevent fan interference on deep fly balls, but because people can’t reach it, they’re going to get drilled in the face by deflections when they’re standing in the front row. Mark my words and be careful! That’s an awful spot. You basically never want to be in the front row anyway unless there’s a chance to get a toss-up, in which case you can just move down there for a few moments. 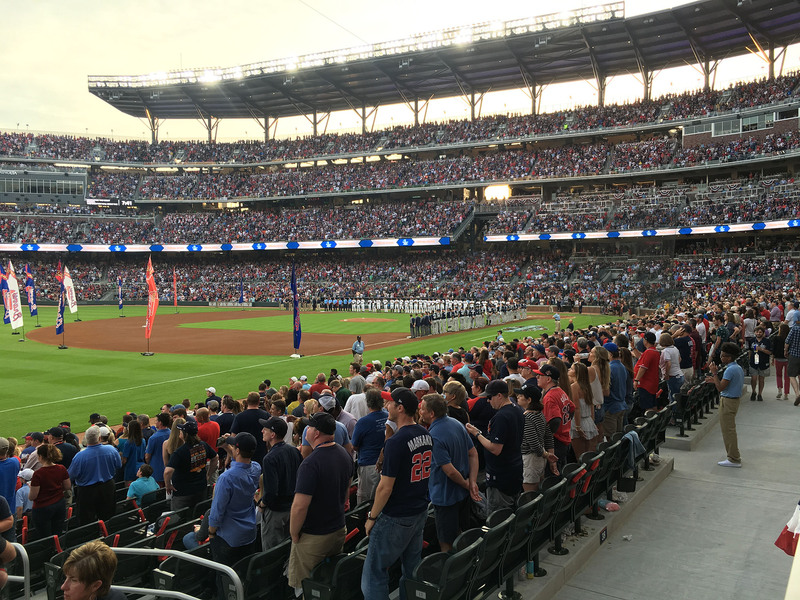 Naturally, since that’s the only place to get toss-ups near home plate, it was packed. 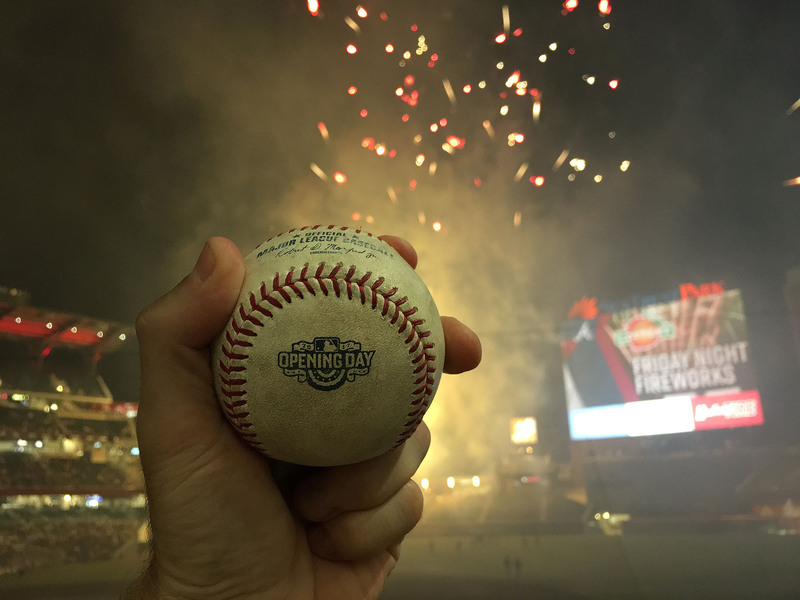 I knew I had no chance, and when the visiting Padres cleared the field, my total number of baseballs for the day was still at four. Not great. Not awful. But this day was bigger than my typical ballhawking mission. 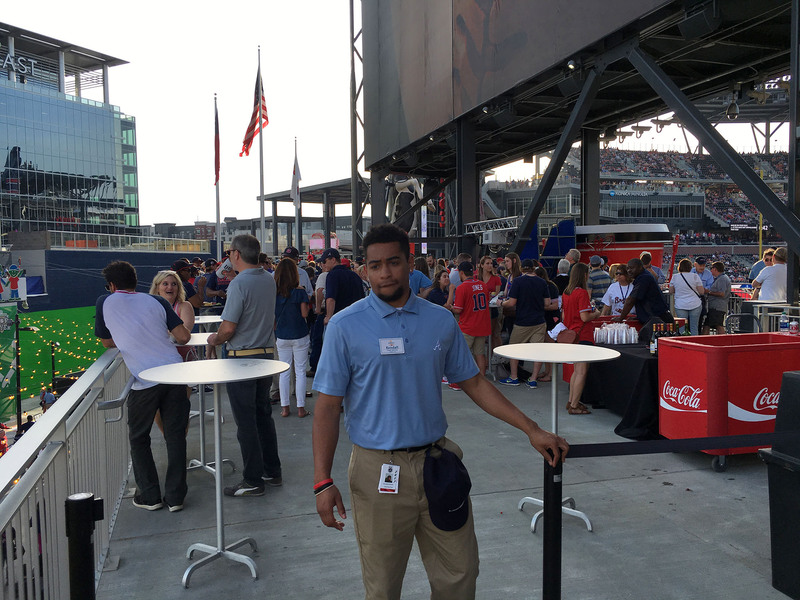 I was just glad to be there and for the next hour, I turned my attention to exploring the stadium. 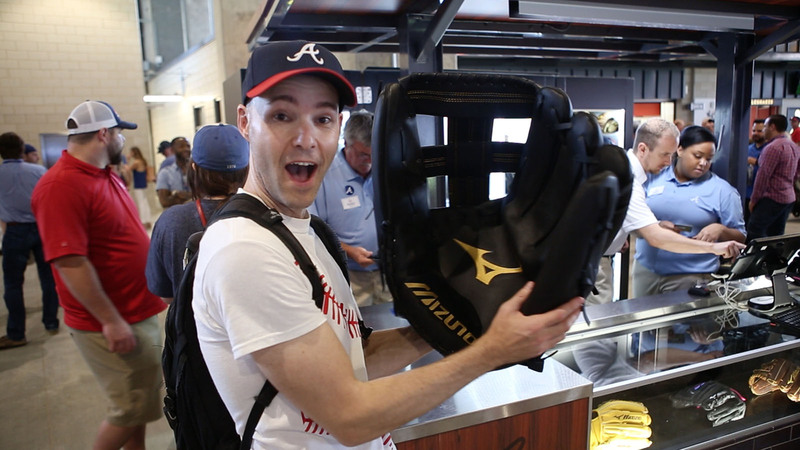 Fans are able to rent (normal-sized) gloves there for free. (Mizuno will place a $1 hold on your credit card, but then refund it when you return the glove.) Cool idea. The area behind the batter’s eye was blocked off for a private event. Bah!! 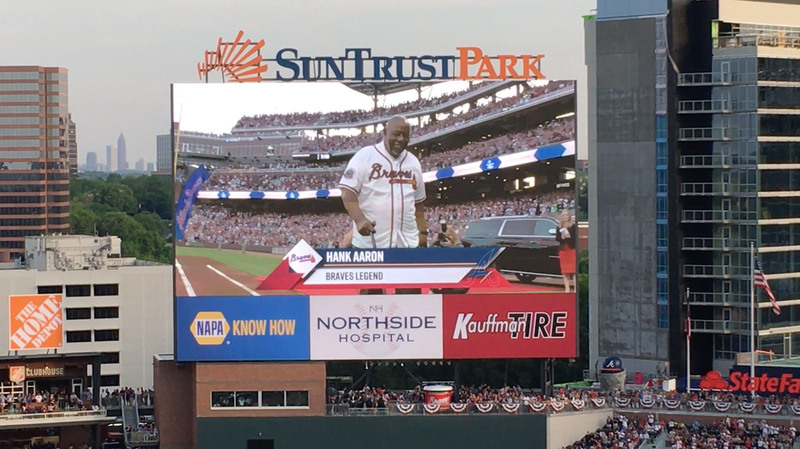 When the 83-year-old Hank Aaron walked out onto the field, I got chills. 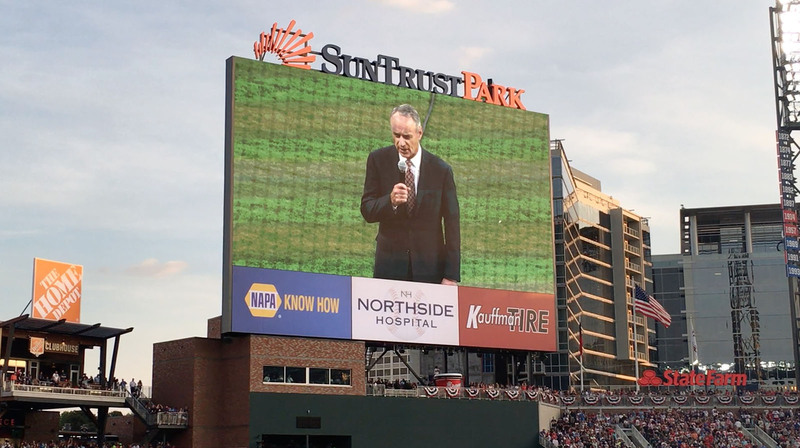 There was a specific type of buzz throughout the stadium that only occurs in the presence of a true legend. 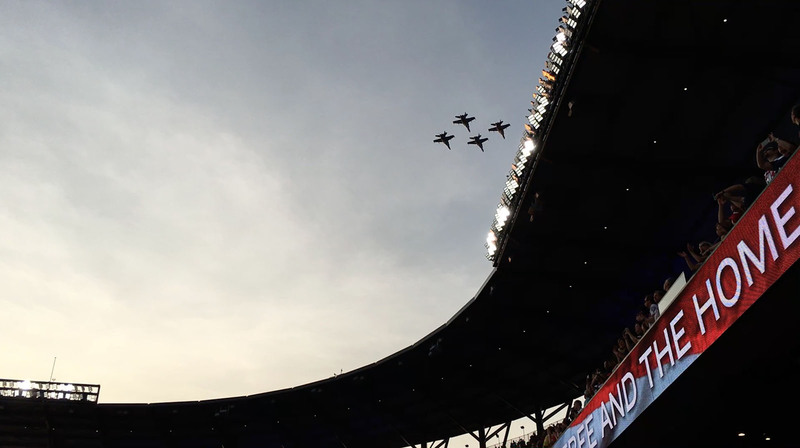 That pitch was thrown by Julio Teheran; Manuel Margot, the Padres’ leadoff batter, boldly swung at it and flied out to center fielder Ender Inciarte — and just like that, a new era of baseball in Atlanta was underway. 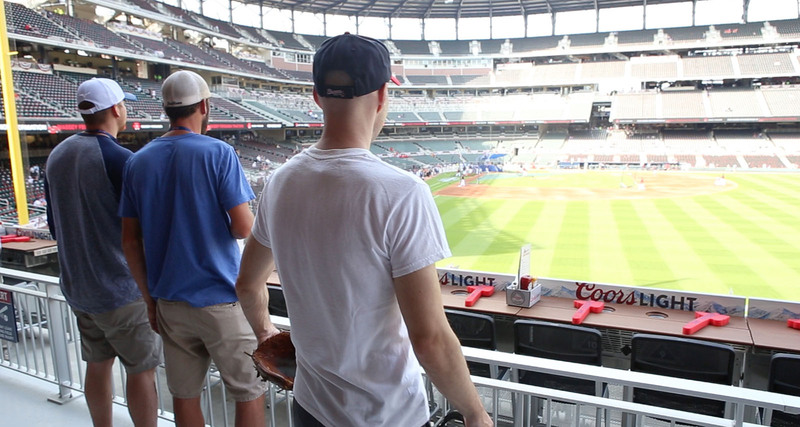 Brandon came downstairs soon after, and we moved to left field. 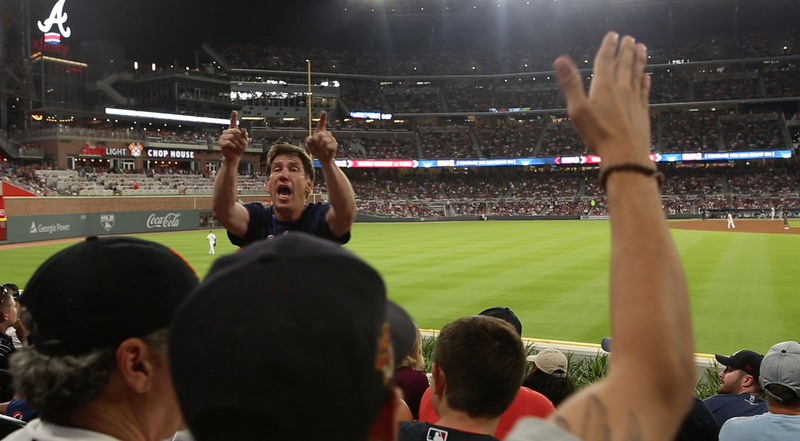 To hell with foul balls and toss-ups, at least until the first home run was hit. 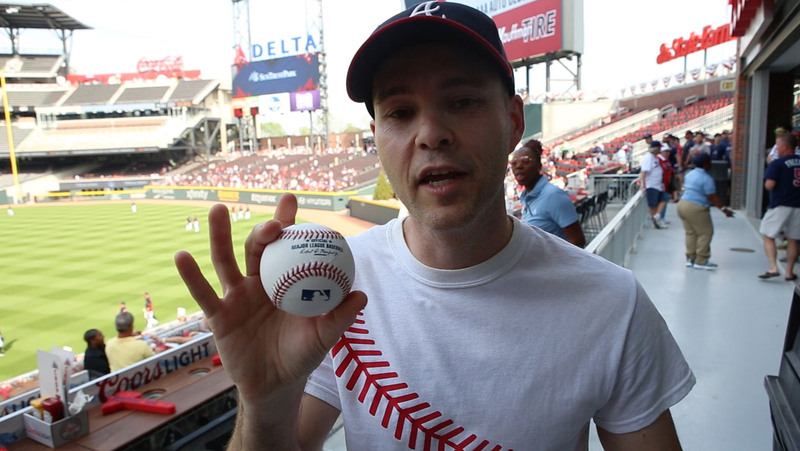 I needed to be in the outfield to have a chance, however small, of catching it. That belonged to a friendly man sitting behind me, and when he told me how much he’d paid for four of them, I struggled to maintain a poker face. 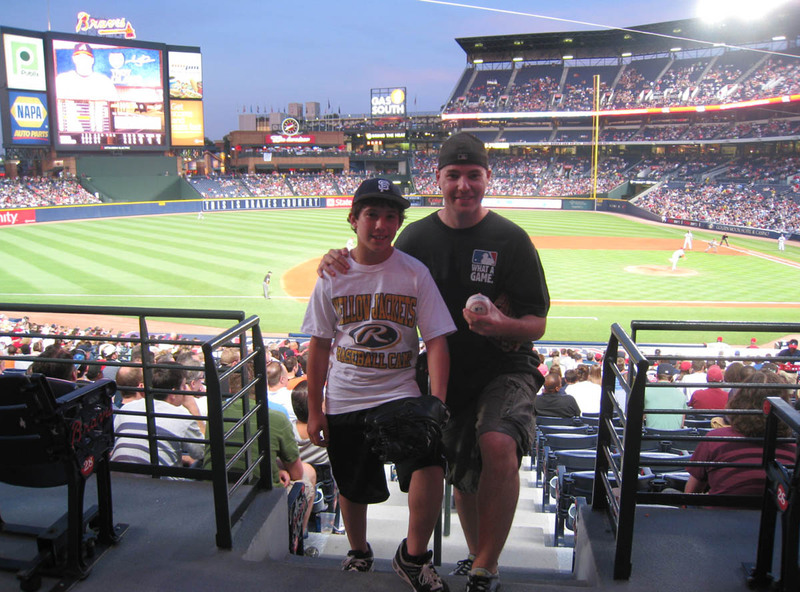 I’m not sure where he got ’em, but when I was browsing online just a few days before the game, tickets really weren’t THAT expensive. 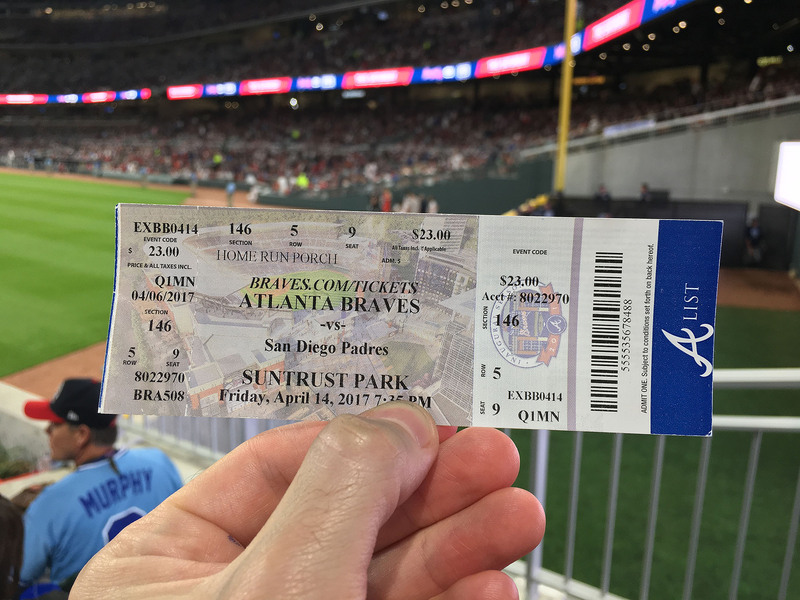 This was the first inaugural game I’d ever been to at a brand-new stadium; I was expecting World Series prices, but it turned out to be just like any other normal Opening Day. What’s up with that? Is that an Atlanta thing? Have I gotten jaded by living in New York City my whole life and overpaying for everything? 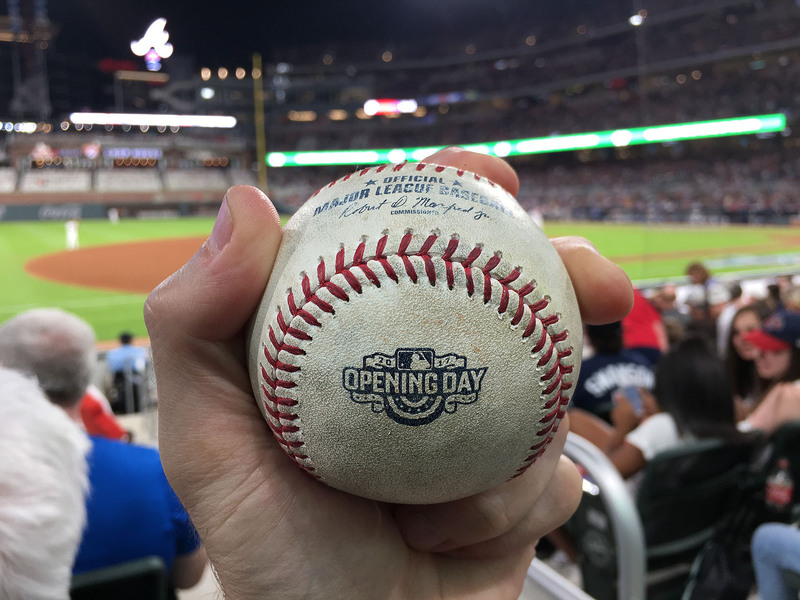 I was hoping that there’d be ultra-rare SunTrust Park balls with the date of the inaugural game stamped below the logo, but eh. 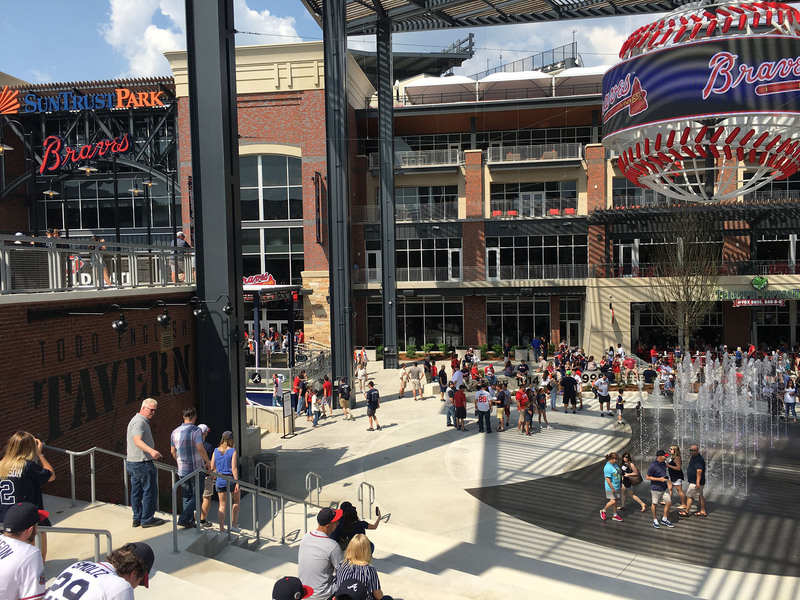 Having a generic Opening Day logo is now more important than commemorating the first game at a new stadium? It didn’t used to be like that. Look at this ball from the inaugural game at Miller Park. I wasn’t there that day; I got lucky and randomly snagged it at a subsequent BP, but anyway, you can kinda/barely see the date at the bottom: APRIL 6th, 2001. 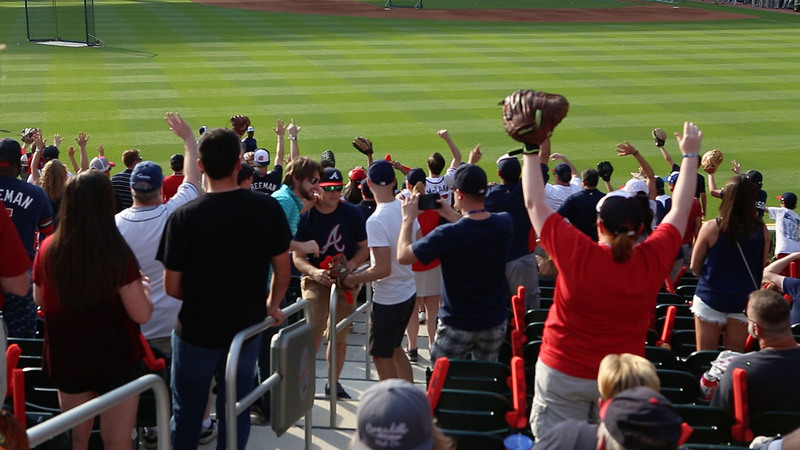 There was no more scoring after the Inciarte home run. 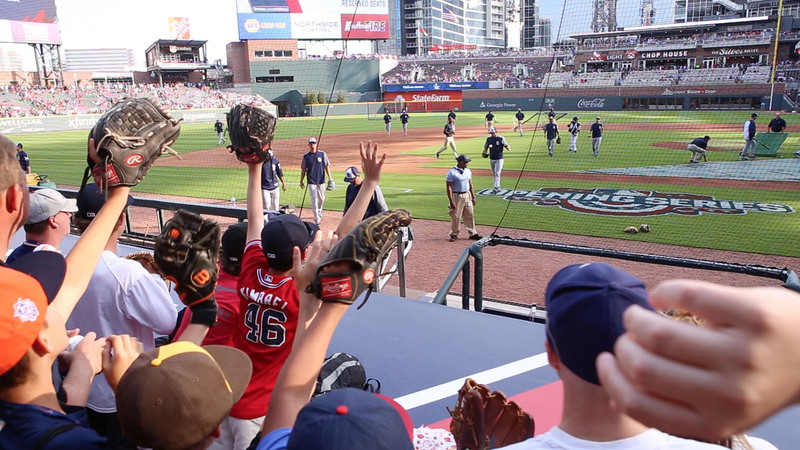 Final score: Braves 5, Padres 2. Ready for the most unusual autograph request of all time? 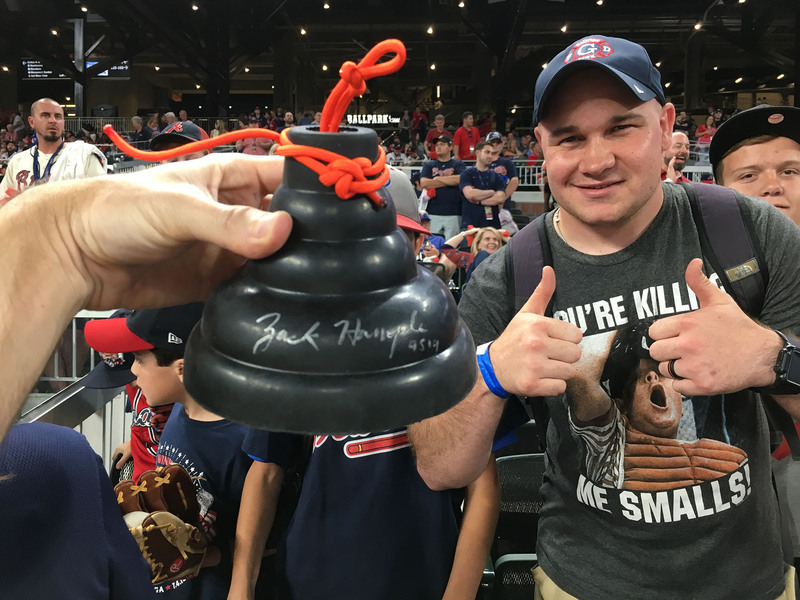 Some dude asked me to sign a plunger! But it’s not just any old plunger. (I made sure it was new and clean and unused.) 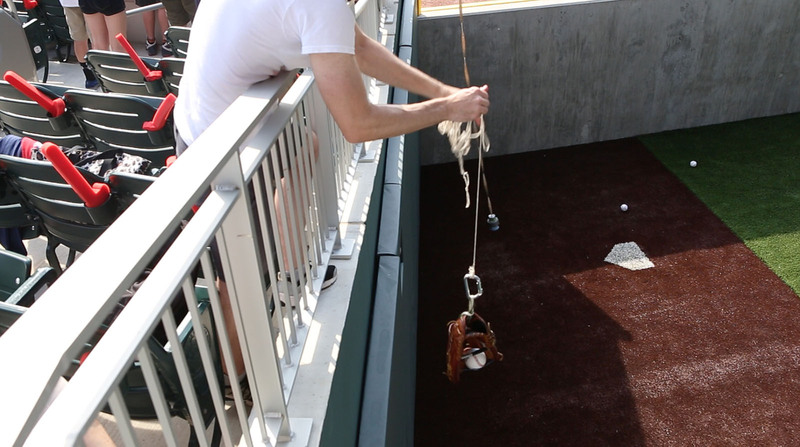 This one was rigged as a ball-retrieving device. Ha!! 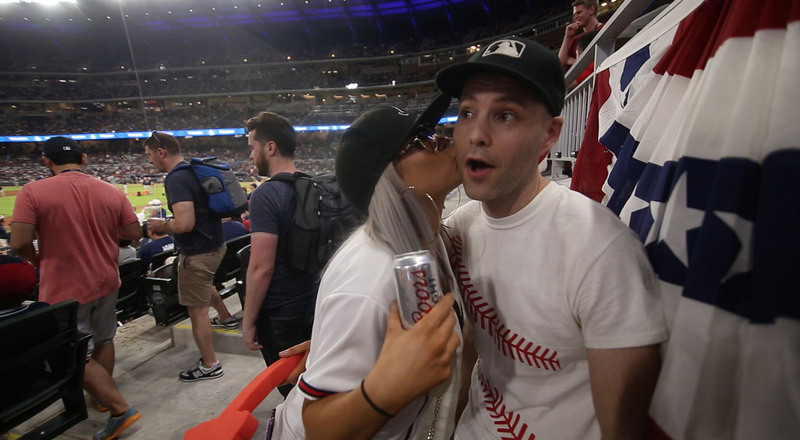 If you’re wondering why it was still so crowded after the game (and during the closing scene of the video), that’s because it was Fireworks Night, so lots of folks stuck around. 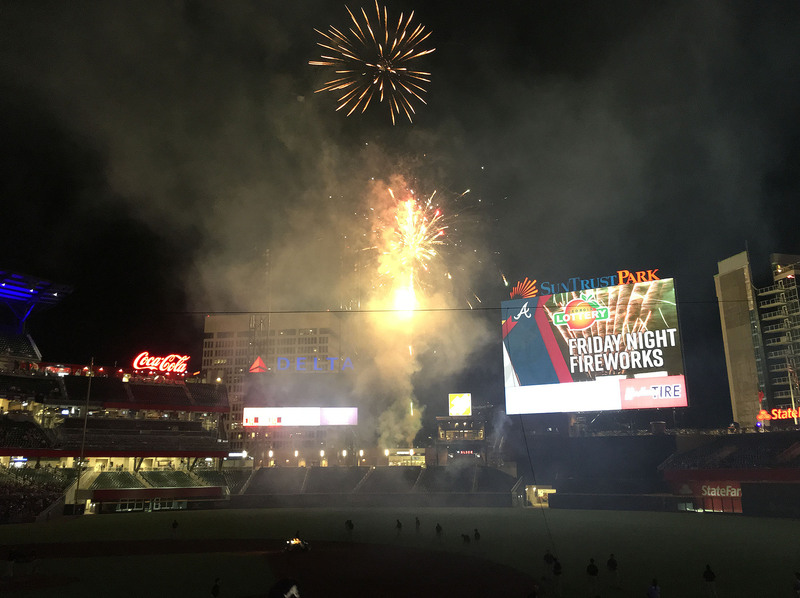 Here’s another fireworks photo with the game-used baseball. Did you notice the “755” against the back wall? 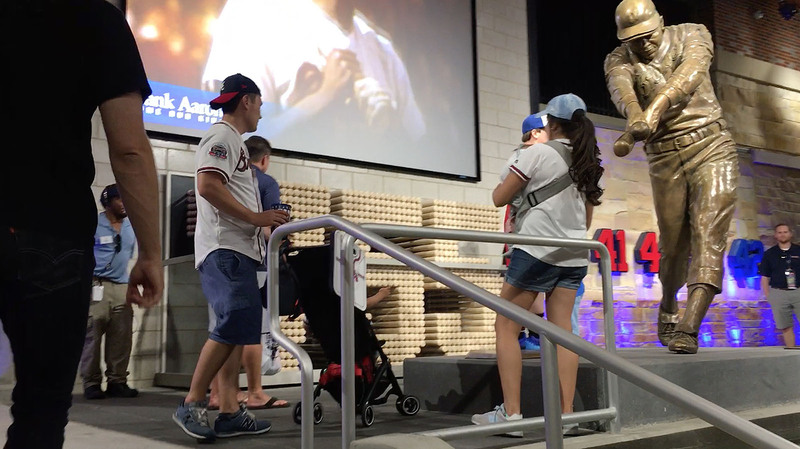 That, of course, represents his career home run total, and it’s made of baseball bats. Good stuff. The whole stadium is filled with things to see and has lots of nooks and crannies and places to wander and explore and hang out. 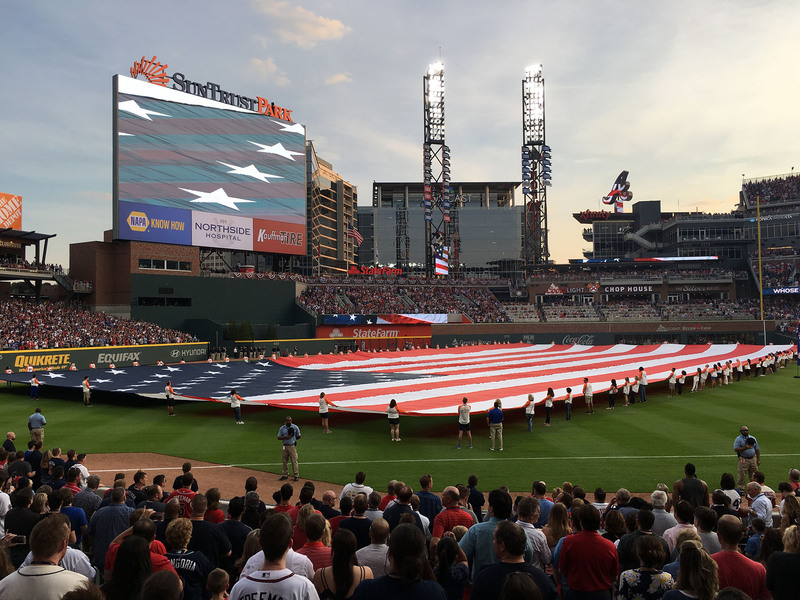 It’s a great stadium overall — one that requires several days to see everything — and the Braves did a solid job of showcasing the teams and legends of the past. Once again, I realize that the crowd was extra large and that it won’t always be like this, but just a little warning: the taxi line was nightmarish. 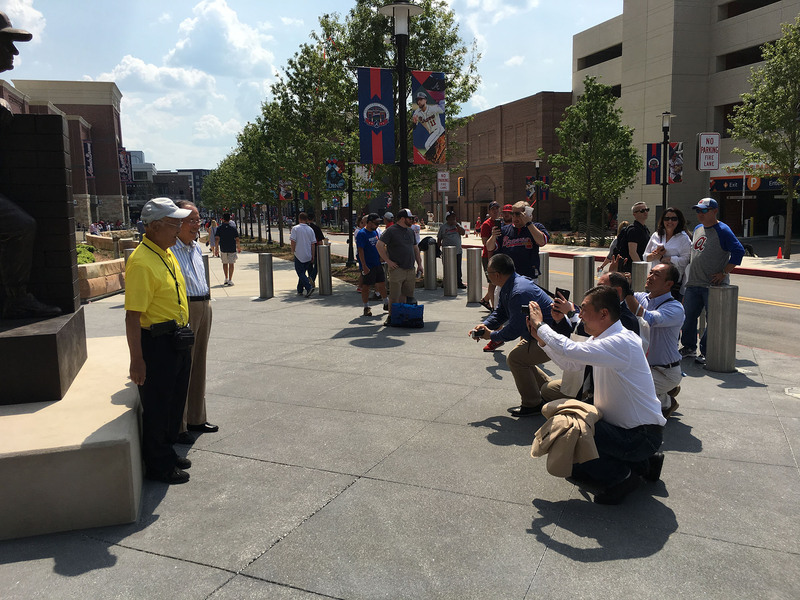 There was one spot where fans had to wait for an Uber. That line was the length of a football field. Traffic wasn’t moving *and* there were no Ubers in sight. Brandon and I were staying at a hotel roughly one mile from the stadium but because of the indirect route, it turned out to be a two-mile walk. That’s how we got back both nights. 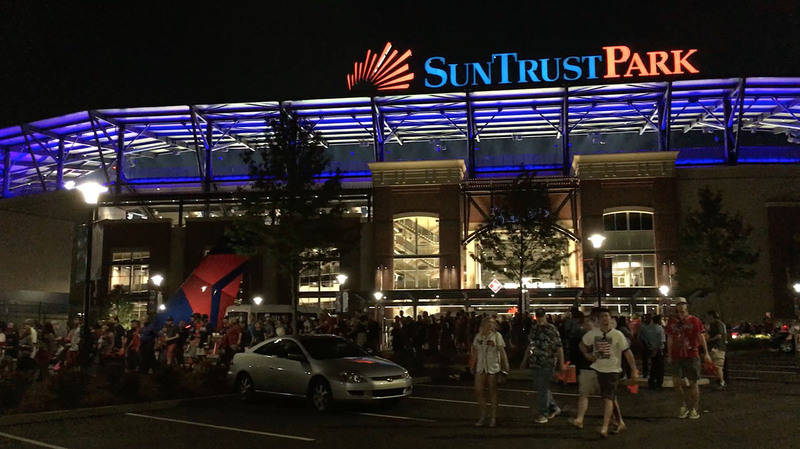 (We were at SunTrust again for the next game.) And it wasn’t a pleasant walk. We had to pass alongside a construction zone and encountered a few semi-shady characters along the way. I’m from New York City, so whatever — I *am* a shady character, and I’m used to walking everywhere (I don’t even own a car), but poor Brandon from SoCal couldn’t deal with it and nearly had a meltdown. 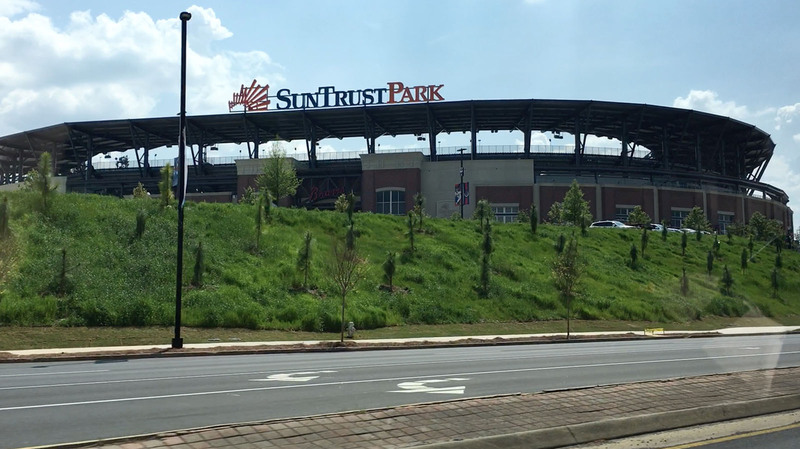 Why is the Uber situation so awful at SunTrust Park? Well, because of traffic. Duh! But more specifically, it’s because none of the local Uber drivers want any part of that post-game madness. 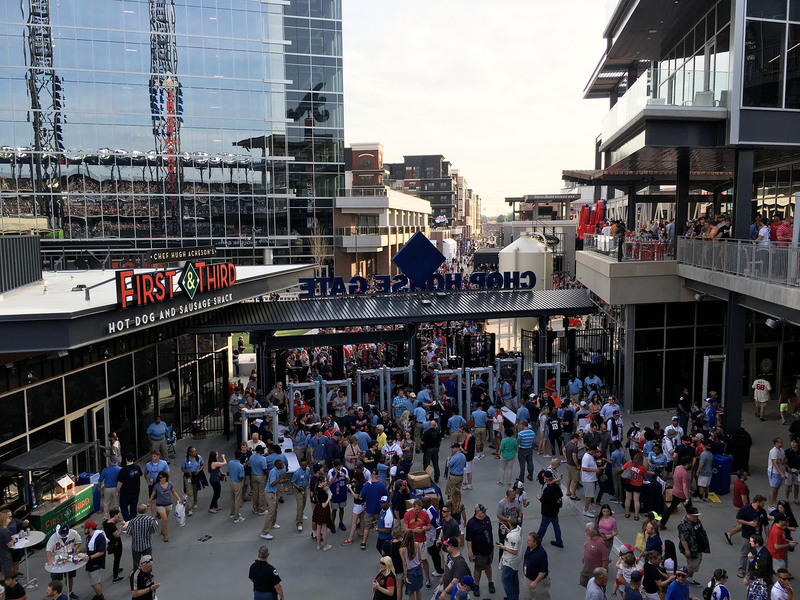 I asked a driver about it the next day (drop-off is a breeze when going TO the stadium hours before game time), and he said it’s not worth waiting in traffic for an hour only to earn a few dollars for a short ride. 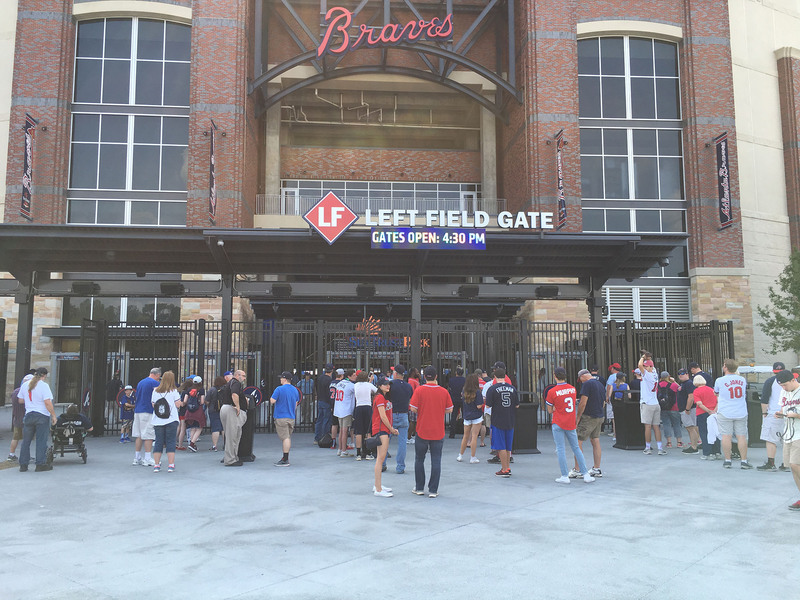 My advice, therefore, for my fellow baseball travelers, is to stay close to stadium and walk to your hotel . 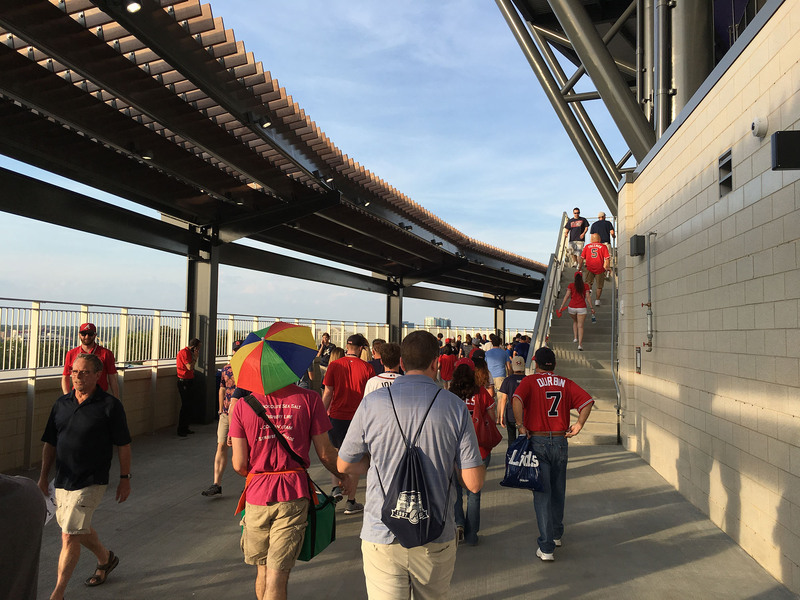 . . or walk half a mile (or more) from the stadium and call a taxi from there. That’s pretty much it. I haven’t blogged in a while. I forgot how much fun it is (and also how much time it takes) to crank out a 3,600-word entry. Hope you enjoyed it. Keep scrolling for that video I’ve been talking about . . .
• 45 balls in 8 games this season = 5.63 balls per game. 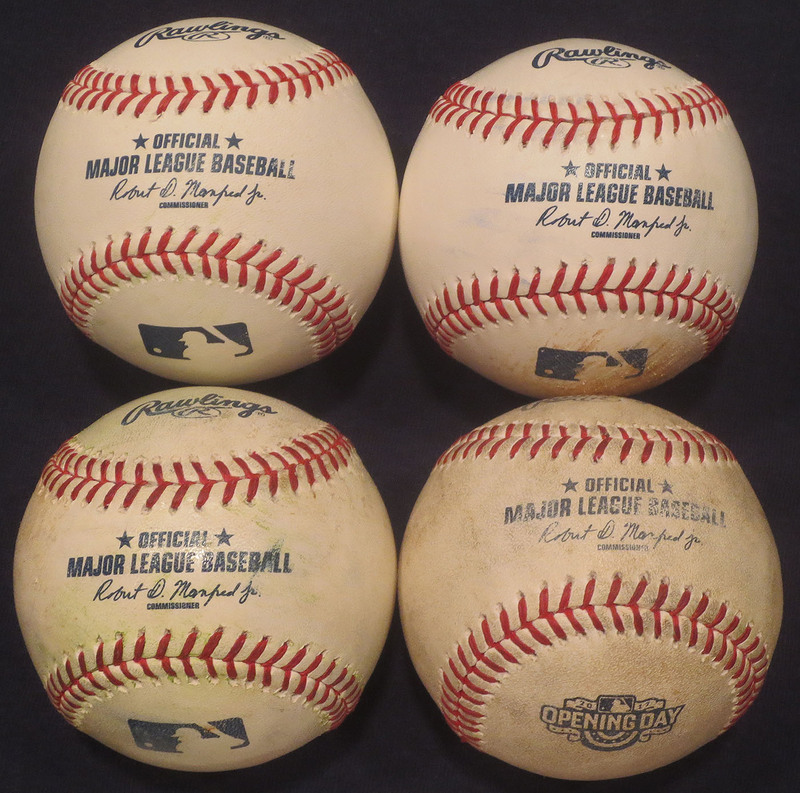 All of the baseballs that I snag this season are raising money for the charity Pitch In For Baseball. 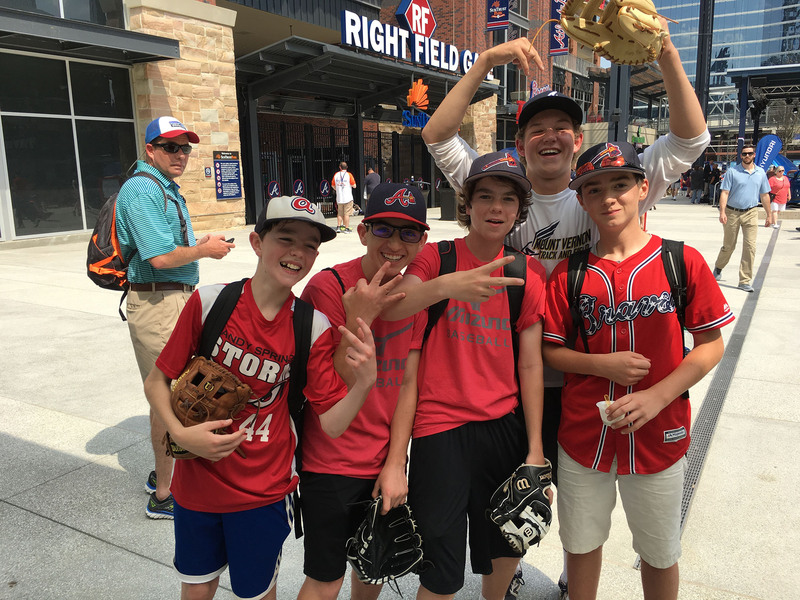 If you donate money, you’ll be entered into a drawing to win some baseball prizes, including a custom Wilson glove. CLICK HERE to watch a YouTube video explaining how it all works. Thanks for reading/watching and don’t forget to subscribe to my YouTube channel. 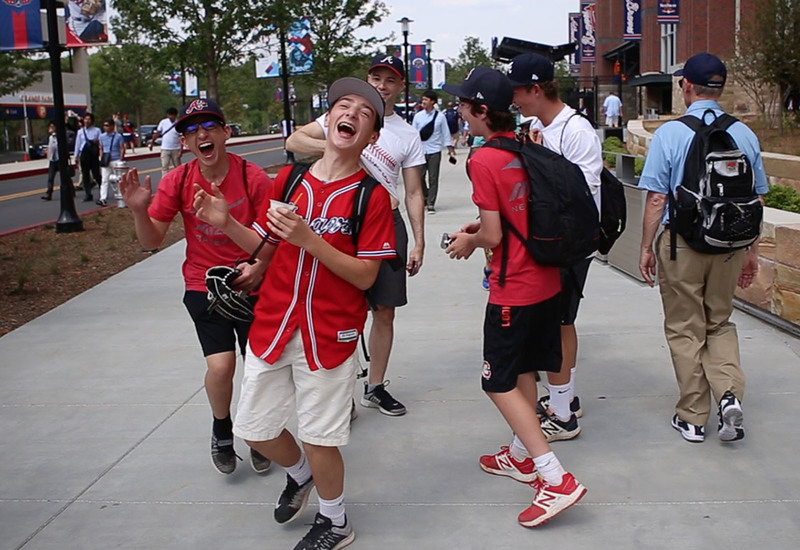 I’ll be posting dozens of videos this season. Really missed reading the blog entries! I really missed your blogs. Please post at least a couple more. Also on April 27 at Progressive Field you snagged 2 game hrs right? On your blog it says 1. I must admit that I really miss your game blogs like these, but understand how much work is involved in putting them out compared to the videos. What does a ” semi-shady ” character look like ? They must be bad to impress a New Yorker. 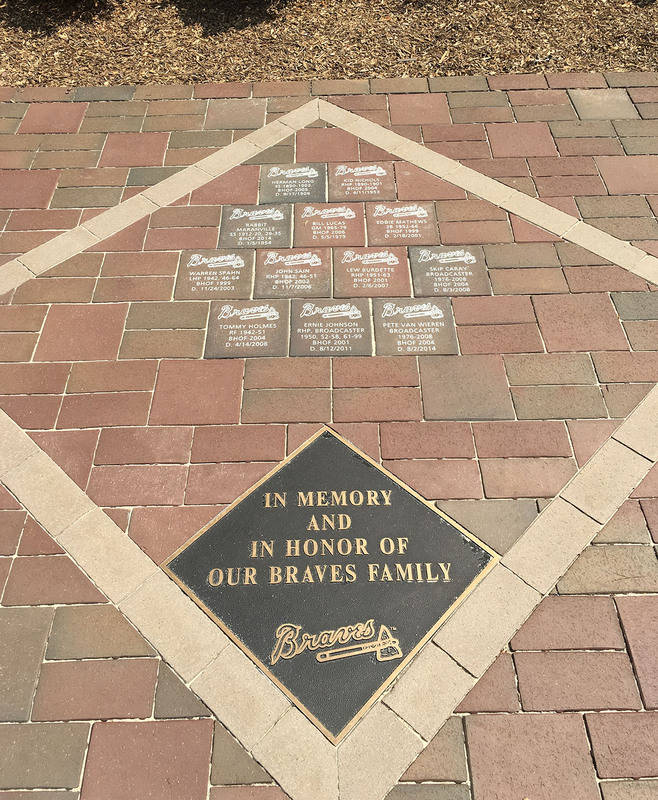 I can`t believe that the Braves didn`t use a dedicated commemorative baseball for their first game at a new stadium. They probably ran out of money after the build lol. Keep the blogs going for important games and milestones. And games with epic food consumption. There are plenty of people like me who enjoy reading them. 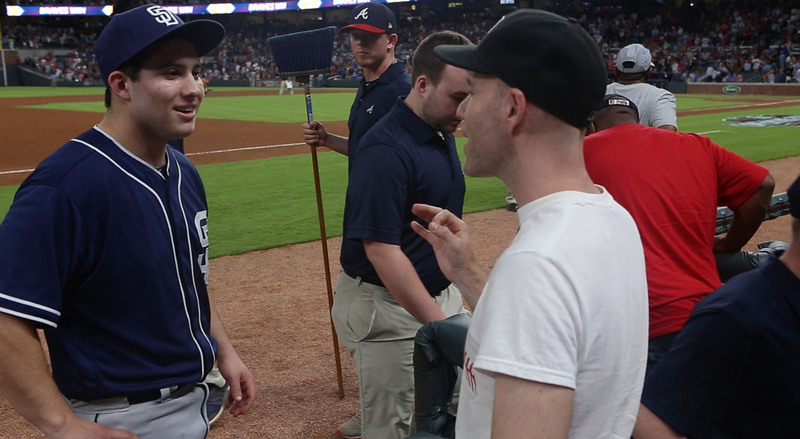 Zack, man, I know you love the YouTube channel and the fact it’s much easier than the blog, but there is just something about reading about your ballhawking and the games that make it more enjoyable. I do hope you keep writing here often, you’re clearly gifted with being able to paint a picture of being there. I check this site almost daily, just to see if you’ve written more. Keep it up, there’s lots of us fans out there who actually prefer the blog and appreciate the work it entails to do. Thanks! Hopefully I’ll find time to write more. Thanks for catching that mistake. It has been fixed. Semi-shady means I briefly considered my safety and my whereabouts, but I assumed (correctly) that it would be a non-issue. Anyway, thanks. I know you (and others) prefer the blogs, and hopefully I’ll still find the time to write them on special occasions. Data limits are dumb. But thanks — I appreciate that. Nice to hear from you. Small chance I’ll make it back there this year, but not sure when. Thanks. Glad you enjoyed it. I’m doing my best, but there’s only one of me, so I have to be selective about how to use my time. As a Japanese, I just want to tell you that Bobby Cox is not big in Japan or other east Asian countries, so I don’t know why they were excited. 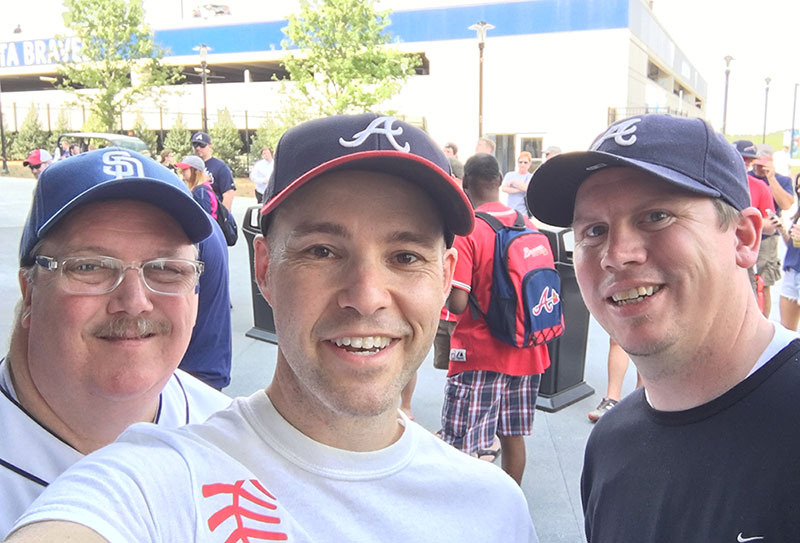 Maybe, they were just excited to be at SunTrust Park, haha! 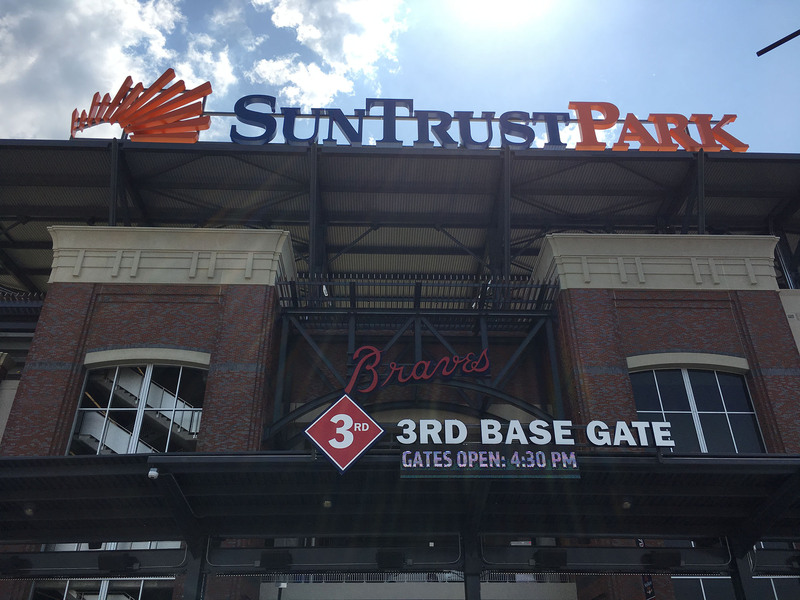 Is security cool with ball retrievers at Suntrust Park? Not sure if there’s a blanket policy. Just be careful. Security is pretty chill there overall.